I had a colleague who caught the H1N1 virus bec of her trip to Thailand, so I worked from home this week except for Friday. The days passed by quickly and once again it's Saturday! 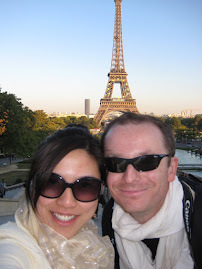 We decided it's better to stay home than mingle in the high-traffic malls where the virus may be present. 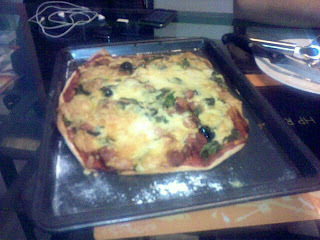 So we took our time and made our own pizza. 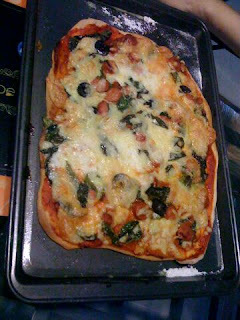 The bread dough was purchased from Carrefour last week' where they have stock of pizza dough from France. Then we topped it with 3 kinds of cheese, some basil and olives, plus beef sausages sauteed with onions, pizza tomato sauce and a bit of olive oil. It was yummy! Definitely tastier than pizza delivery. 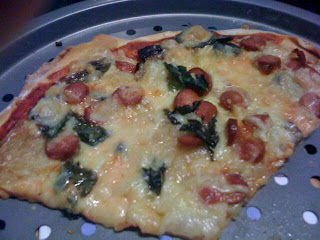 Plus, hubby made sure that he made it thin crust just like how Italians do it. Shame we don't have a wood oven else it would be perfect! Anyway pizza and some ice cold coke made my late lunch an interesting one.